Unlike my usual practice since joining GoodReads, I very deliberately did not take notes while reading From Eternity to Here. I wanted to enjoy myself with an interesting topic (cosmology) and not be overly concerned with learning anything - the nonfiction analog of the fictional brain candy I read. The problem under discussion here is the "arrow of time" - why, unlike the physical principles of space, do the principles of time appear irreversible? It turns out we simply don't know. We know enough about quantum mechanics and classical gravity to make reasonable guesses but absent a theory of quantum gravity we're pretty much fumbling around in a very dark room. 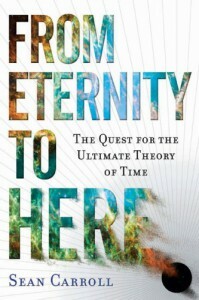 Carroll has his own favored answer - which has to do with the multiverse, de Sitter spaces, infinite entropy, low-entropy states and baby universes, and preserves the reversibility of time (though not within a particular universe (sorry, "Dr. Who" fans) - but he's honest enough to say it's unverifiable with the present state of knowledge and lays out other promising competitors. I thought Carroll padded the laying out of the problem (and why it is a problem), and he's another author who has a tendency to make cute, folksy, annoying asides but if you're interested in cosmology this is a book worthy of your unrecoverable time.